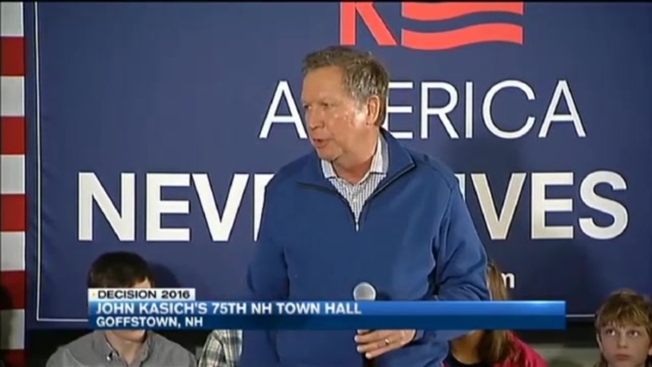 Kasich is back in the Granite State with the state's first-in-the-nation primary only two weeks away. There was cake along with the Q&A to celebrate John Kasich's 75th Townhall in Goffstown, New Hampshire. Kasich has racked up more town halls then any other candidate and is on track to surpass the 100 town halls John McCain held in 2008. That and his inclusive message is what the Campaign says has helped Kasich surge into second place in many recent polls. With just over two weeks till the New Hampshire primary and Donald Trump still holding a 20 point lead, Kasich veered off his usual stump speech to share a warning of sorts. He said, "we have the potential to start another movement that doesn't represent the best of us." Ask later to clarify, Cacic said, "throughout our history, we have had movements that have basically been on the Darkside… You know when you see movements that are rising, anti-Muslim, anti-immigrant, and all these kinds of things, to me, there needs to be a push on the other side to say no. No, that's not who we are and that's not where America needs to go." Who is the leader of the movement on the Darkside? Kasich said, "You figure it out." Asked why he didn't want to mention Donald Trump by name, Kasich said, "because I want to encourage him to do better, to be more positive." Kasich says he is not concerned that Trump will start to focus his attacks on him. Kasich has made a strategic decision not to invest time in Iowa, but to put all his effort into winning New Hampshire. Asked if he had any regrets about not being in Iowa Kasich said, "No, we didn't have enough time to go to Iowa." Except for the Republican debate this week, Kasich will be campaigning in New Hampshire most every day until the primary.